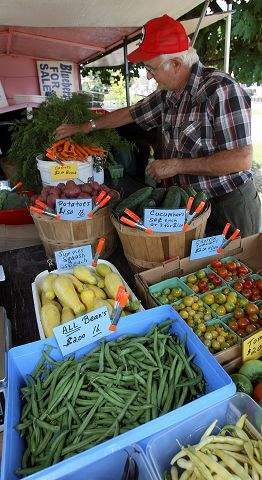 Shoppers go through fresh produce at the farmers market on Aug. 14 in Concord, N.H.
Fred Wheeler of Hill, N.H.. sets up his stand at the Franklin Farmers Market on Aug. 10 in Franklin, N.H. 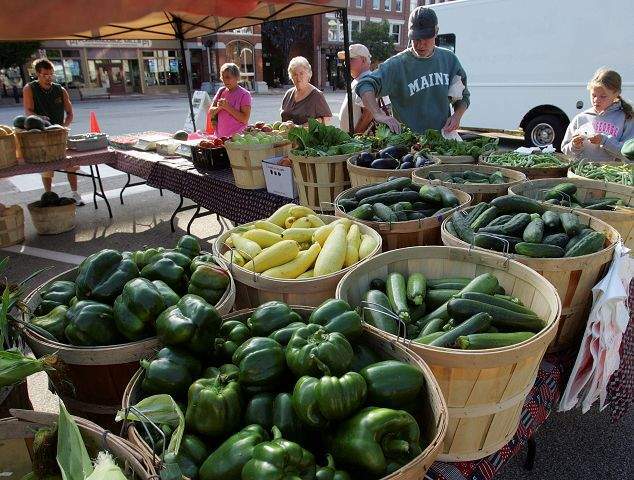 The Northeast has seen good weather for an early harvest of crops. 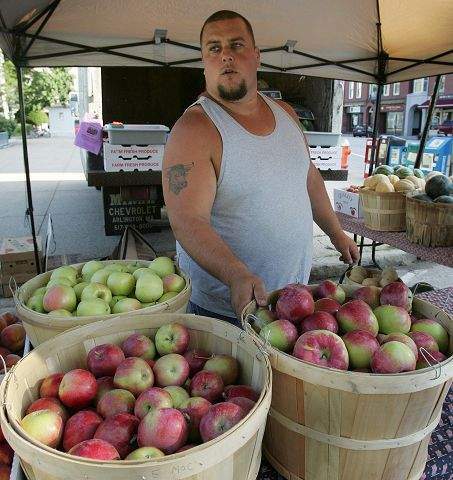 Paul Zydor of Maple Ridge Farm in Loudon, N.H., sets up bushels of fresh-picked apples at the farmers market on Aug. 14 in Concord, N.H.
BOSTON  Warm weather has many fruits and vegetables ripening early this year, and on some farms, fall crops will be ready well before Labor Day. Early apples already are ripe for picking in the Northeast and Midwest. Sweet corn was a couple of weeks ahead of schedule, as were many tomatoes, blueberries and peaches. And, if the warm weather holds, families might have Halloween pumpkins well before October starts. Major row crops, such as corn and soybeans, also are a little ahead of season, said Julie Schmidt, a statistician with the National Agricultural Statistics Service. A mild winter let farmers plant early, and warm weather since has helped their growth. The conditions have been nearly ideal, Schmidt said. The early harvest is a mixed bag for farmers. Those who sell directly to consumers are most likely to benefit because customers generally are happy to have fruits and vegetables earlier, said Ruth Hazzard, a vegetable specialist at the University of Massachusetts Extension. But weather-related schedule shifts can cause problems in the wholesale market, where prices are determined by what happens throughout an extended area and timing can be everything. If it happens that our crops come in really strong at the same time that Quebec comes in and Virginia comes in and New Jersey comes in, if all thats happening at once just because of the way the weather works out, then the prices go down, Hazzard said. The year began with a balmy spring and early bloom. Then came a particularly hot summer for the Northeast and parts of the Midwest. Eric Henry, owner of Blue Hills Orchard in Wallingford, Conn., said he began picking one type of apple, Paula Reds, in the first week of August, about 12 days ahead of normal. Another early variety, Ginger Golds, werent far behind. This is the earliest ever, said Henry, who also began picking peaches about two weeks sooner. The Paula Reds and some other apples are at least two weeks ahead of schedule at Apple Holler in Sturtevant, Wis., said owner Dave Flannery, who described the recent weather conditions as almost tropical. For him though, earlier hasnt been better. Even insects seem confused by the weather. Cranberry growers in Massachusetts say a pesky beetle that usually doesnt invade the bogs until about now has been chomping away for weeks. But another pest, the fruitworm, may have died off earlier than usual. Overall, crop production generally has been strong. Diseases that ravaged tomatoes and other plants in the Northeast during the cold, damp summer of 2009 largely have been held in check this year. While thunderstorms have pelted the Midwest, New England has had less rain than usual. The shortage has made the plants growth spurt more difficult for many farmers to contend with. In some cases were irrigating just about every other day because it has been so dry, said Jeffrey LaFleur, executive director of the Cape Cod Cranberry Growers Association. Despite water worries, cranberries are running a good two weeks ahead of schedule and already are showing color, LaFleur said. That could move up the harvest, which usually starts in earnest between Sept. 15 and Oct. 1 in Massachusetts, the nations second largest cranberry producer behind Wisconsin. Phyllis Tougas, owner of Tougas Family Farm in Northborough, Mass., said its been a crazy growing season. Some of the pumpkins planted in June had ripe fruit in early July  a month or more ahead of schedule. And blueberry pickers, she said, shouldnt procrastinate. Last season, we had a huge tremendous crop, we picked well into September, but I dont see that happening this year, she said. But not all parts of the country are ahead of schedule. Charlie de la Chappelle, who grows a couple hundred thousand apple and pear trees in Outlook, Wash., says both are about a week behind after a cloudy and cool spring there.